The April board meeting of the Willow Meadows Civic Club (WMCC) will take place on Tuesday, April 9, 2019, at 7:00 p.m., in Room 209 of the Willow Meadows Baptist Church, 4300 West Bellfort Ave., Houston, Texas 77035. Topics will include public comment, general association business, committee reports and feedback, policy reviews, and unfinished and new business. The board may, if needed, adjourn to Executive Session to discuss Deed Restriction Enforcement Actions which may lead to legal enforcement actions. 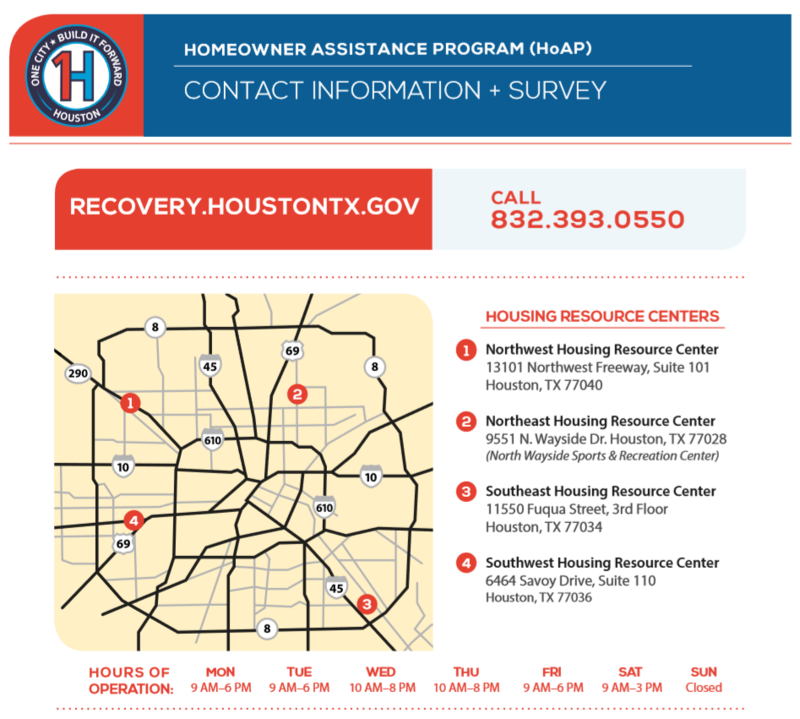 HOUSTON - The City has taken a critical step forward with the opening of four Housing Resource Centers, one in each quadrant of the city, to use $1.17 billion in federal aid to assist Houstonians whose homes were damaged by Hurricane Harvey. Please see the info flyer. Rice University’s Center for Energy & Environmental Research in the Human Sciences (CENHS) and Department of Anthropology is conducting research to find out, via surveys and in-person interviews, how people whose homes were flooded decide to stay or relocate. All of the results from this research will be anonymized, and shared with City of Houston and Harris County officials to help their planning and recovery efforts. For more information on this project, download this flyer and/or contact Principal Investigator Dominic Boyer or Project Lead Mark Vardy (their email addresses can be found on the flyer). Mayor Sylvester Turner announced the return of curbside recycling of bottles and jar made from clear, green and brown glass. A senior citizen who meets the criteria specified in the WMCC Bylaws (namely, owns a lot located in Willow Meadows and resides in the home situated on that lot, and is eligible for an Age 65 or Older Residence Homestead Exemption with the Harris County Appraisal District) may elect to freeze his or her dues at a reduced rate. To apply for a rate freeze, download/print/mail this hardcopy form. The Willow Meadows Civic Club board would like to remind residents that renting out your home for less than 30 days is a violation of our deed restrictions. Please be aware of this when renting out your home. When you plan to be out of town, even if only for a short period of time, request a Vacation House Watch by calling 713-447-0200 or filling out this form. The Architectural Control Committee, in compliance with Article II of the Deed Restrictions, is in charge of reviewing all required plan submissions given to it or to any Association officer and will communicate to the residential applicant approval or denial of the submitted plan. Chapter 202 of the Texas Property Code was amended effective January 1, 2012, to add Section 202.006 regarding Public Records. The WMCC Records Production Policy can be viewed here. Chapter 209 of the Texas Property Code was amended effective January 1, 2012, to add Section 209.005 regarding Document Retention. The WMCC Document Retention Policy can be viewed here. Chapter 209 of the Texas Property Code was amended effective January 1, 2012, to add Section 209.0062 regarding Payment Plans. The WMCC Payment Plan Policy can be viewed here. Chapter 209 of the Texas Property Code was amended effective January 1, 2012, to add Section 209.0064 regarding Third Party Collections. The WMCC Collection Policy can be viewed here. Looking for a private environment designed just for you and your neighbors? Then Nextdoor - the secure private social networking service for neighborhoods - is for you! Residents can choose to see and respond to updates via email or directly on the website. General Meetings are held the second Tuesday of the last month of each quarter, 7:00 p.m., at Willow Meadows Baptist Church (unless otherwise specified). The agenda is available here. Homeowners are always encouraged to attend. Board Meetings are held the second Tuesday of each month in which no General Meeting is scheduled, 7:00 p.m., in the second floor board room of Willow Meadows Baptist Church (unless otherwise specified). The agenda is available here. Homeowners are always welcome to attend. Do You Know Your Hurricane Threat?